• 2000 sqft , 2 bath , 3 bdrm single story – FOR SALE USD599,900 . 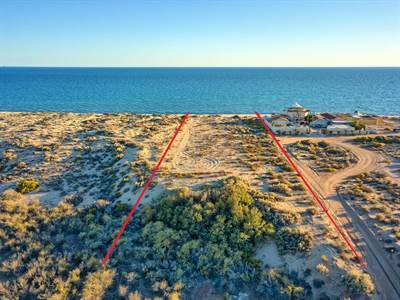 Best beach in Rocky Point Amazing home huge lot! Located on one of the most popular beaches in Las Conchas Sec 5 this amazing beachfront home is now for sale. Call now. Huge lot, awesome layout, 6 car garage, new seawall, great rental history… the list goes on and on. Seller is including ATVs for immediate enjoyment. 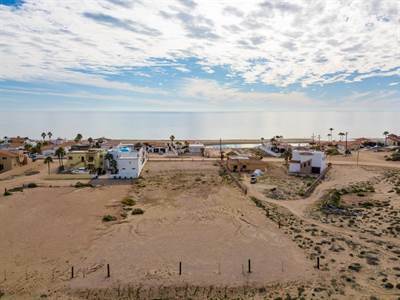 This 3 bedroom beachhouse not only is located on one of the nicest beaches in Rocky Point the large garage could be converted to a guest house giving new owners options for extra guest. The land itself is also a huge plus being most lots are around 600 square meters in size – this lot has over 1800 square meters of land. From location to layout, the beach to the rental opportunities this home is very unique. Call now to set up a time to see this wonderful home! Located in the popular gated community of Las Conchas this amazing beach house is now on the market. Possible financing!! 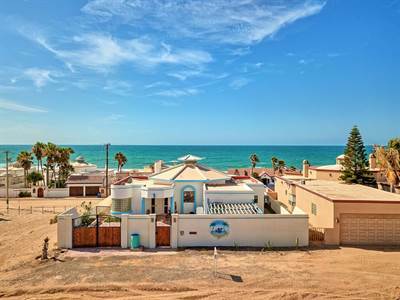 Awesome open layout with 5 bedrooms, 2400 square feet of livable space to enjoy, a huge patio with outstanding views of the Sea of Cortez and a margarita deck for happy hour. Prime location with beach access directly across the street. The Completely Separate with separate access “Mother In Law Quarters” and/or separate apartment (VRBO-Income Potential) has two bedrooms and a full bath. From the moment you walk in the door you know the good life has arrived. Property has new trust bringing more value to this opportunity. Seller will leave quads to enjoy from day one!! Call now for more details – will be going on the internet and MLS in the next week. Located in the popular Casa Blanca beachfront gated community Penthouse 303A with a two car garage is now for sale. Great location with wonderful views of the ocean and common areas. 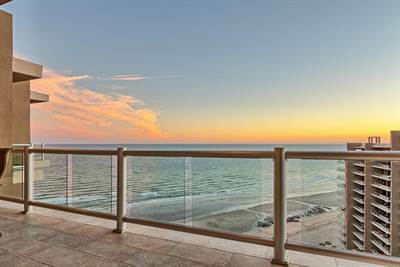 This fully furnished 2 Master bedrooms, 1 guest bedroom, 2 bath beach condo is ready to enjoy the moment you walk in the door. Large open living area with 2 master bedrooms up front this beach condo has one great layout. For some 2 bedrooms is enough but then there are those that want the space for family – the option to keep everyone together and the third bedroom gives us that option. Property is held in a US LLC for quick close and lower closing cost. Unique to Casa Blanca this penthouse comes with a garage. One of three garages in all of Casa Blanca. For the family who wants the ability to leave the toys and just show up. This condo gives you that ability. Casa Blanca is unique having an amazing common area with multiple barbecue areas, pools, palapa and a professional putting green. While many are looking for the vacation getaway they also want the option to rent. This property is currently a rental with great history not to mention many repeat clients. Call now to see one of the best values on Sandy Beach. Granite being installed March 25th taking this condo to the next level with not only location, financing, views but also granite counter tops. • 142 sqm , 2 bath , 2 bdrm single story – FOR SALE USD359,900 . 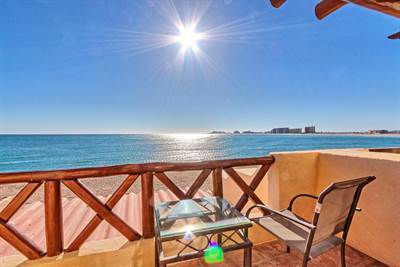 Located in the popular Bella Sirena in Rocky Point Mexico D602 is now for sale. With amazing views from the moment you walk in the door this beautiful 2 bedroom 2 bath condo comes fully furnished and turn key. Only thing missing is you. With over 1450 square feet livable and 300 plus square feet on the patio this condo give you the space you need to enjoy the good life. 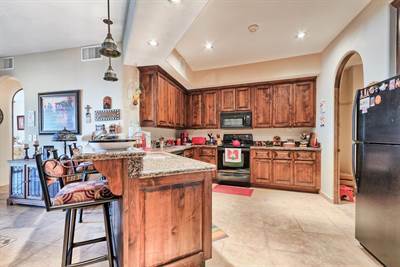 With a large open kitchen, living area and patio it is hard to resist. Bella Sirena is unique with larger condos, arched doorways, amazing cabnitry – the master suite comes with a wak in shower and bathtub aswell as a walk in closet. Call now to see this beautiful condo. Enjoy your good life at Bella Sirena. • 1950 sqft , 4 bath , 1 half bath , 3 bdrm 3 story – FOR SALE USD359,900 . Beachfront villa with all the amenities! Amazing ocean views from the moment you walk in the door. 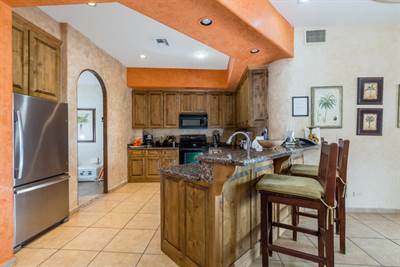 This beautiful villa is one of 5 that are beachfront at the Pinacate resort. 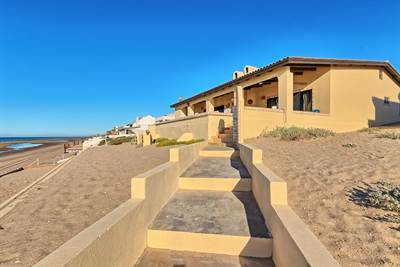 What a good life it is to have a beachfront villa with all the amenties of a resort like Pinacate. From the outstanding location to the newly remodelled common area Pinacate is one of the nicest resorts in Rocky Point. Uncommon to most common areas Pinacate is unique with its own Private owners common area with pool and Jacuzzi aswell as barbecue area. 3 bedrooms 3.5 bathrooms, beautiful kitchen remodelled with granite counter tops, new cabnitry. The master suite has the entire third floor to enjoy not to mention a large patio with Jacuzzi… the list goes on. Call now for more details as this wonderful beachfront villa will not last. Great views from every room! Located in the popular beachfront gated community of Bella Sirena A202 is now for sale. 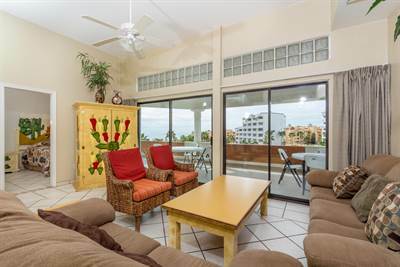 This 2 bedroom 2 bath beach front condo has one amazing layout with a large open kitchen and both bedrooms facing the ocean over looking the sea of cortez. 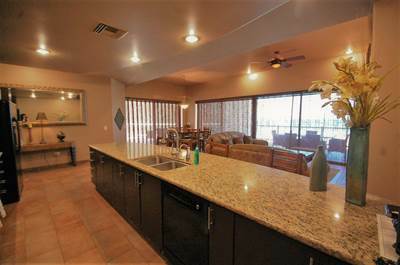 Most 2 bedroom condos are 1200 square feet in Sandy Beach. Bella Sirena has over 1450 square feet of livable in there 2 bedroom condos and over 390 square feet on the patio. Fully furnished this condo is easy the love the moment you walk in the door. Call now for more information about this great opportunity at Bella Sirena!